Although Series 2 might be the more succinct name, 2018 Topps WWE Then Now Forever utilizes a little extra flair (and branding) for the wrestling set based around the flagship design. Hobby boxes contain one autograph, one additional hit, and two inserts per pack. 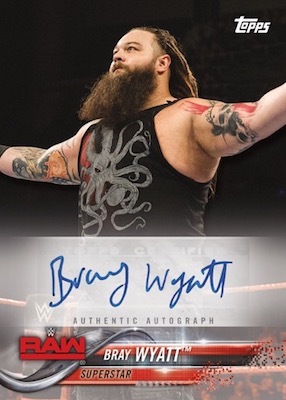 Moving ahead from Series 1, the 2018 Topps WWE Then Now Forever checklist adds 100 new base cards. However, parallels are the same as the initial release, via Bronze (1:2 packs), Blue (#/99), Silver (#/25 - Hobby only), Gold (#/10), Red (1/1) and Printing Plate (1/1) editions. Inserts include the retrospective 25 Years of Raw, with two of the key matches from each year, and the WWE Hall of Fame Tribute continuation set. Filling cards #31-40, part four of the HOF set is centered on "Rowdy" Roddy Piper. For the signed cards, collectors have multiple choices with the base Autograph set and low-numbered parallels: Blue (#/50), Silver (#/25 - Hobby only), Gold (#/10) and Red (1/1). The chase for many are the Triple Autograph cards numbered to just 10 copies. On top of that, the 2018 Topps WWE Then Now Forever relics come in several forms. Each Authentic Kiss Card has lip stains from WWE and NXT subjects, with Autographed Kiss Card (#/25) versions displaying signatures on the lips. Both have Gold (#/10) and Red (1/1) parallels, as well. 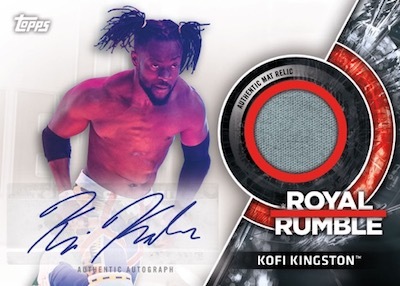 There are also Shirt Relic cards showcasing pieces worn by WWE and NXT Superstars with Blue (#/50), Silver (#/25), Gold (#/10) and Red (1/1) parallels, plus Autographs (#/10). The Mat Relic cards cover Money in The Bank 2017, NXT Takeover: Philadelphia 2018, Raw 25 Years, and Royal Rumble 2018 with event-used mat pieces. These have Bronze (#/99), Blue (#/50), Silver (#/25), Gold (#/10) and Red (1/1) parallels, along with Autographs (#/10). A new addition to 2018 Topps WWE Then Now Forever, the Four Corners Mat Relic set, numbered to 50, celebrates individual wrestlers with four different mat swatches from their career. Parallels include Silver (#/25), Gold (#/10) and Red (1/1) editions. Buy 2018 WWE Then Now Forever boxes direct from Topps. 24 cards. Variation codes ends in #285. Shop 2018 Topps Then Now Forever autographs on eBay. View the 2018 Topps WWE Then Now Forever checklist spreadsheet. For all Topps sets, checklists are normally provided one week before the release date. 2018 Topps WWE Then Now Forever Wrestling Sealed Hobby Box with 2 Hits!